Rice prices have risen for a sixth consecutive day as global supplies continue to be stretched by cyclone damage to crops in Burma. With worldwide demand also at a record high, the cost of rice rose as much as 5.1% to $23.45 per 100lb in electronic trading on the Chicago Board of Trade. Cyclone Nargis hit Burma on 3 May, killing tens of thousands of people in the main rice-producing areas. Rice prices had already hit all-time highs after some weak harvests. The price of US long-grain rice - the global benchmark - has now risen by almost two-thirds since the start of this year. This increase has been replicated around the world, with Thai and Indian rice prices going up by similar amounts. The higher prices have been exacerbated by a number of key producing nations moving to set limits on rice exports to try to guarantee sufficient domestic supplies and calm internal prices. The number one exporter Thailand has announced such a move, as have India, Bangladesh and Egypt. Such export limits have raised concerns in key rice importers, such as the Philippines, which has said it will "aggressively" seek fresh supplies. Analysts said Thursday's announcement that Malaysia had bought 500,000 tones of rice from Thailand was further lifting global prices. "The rice market is dealing with some serious issues right now," said John Casey from Founders Commodities in Chicago. The prices of wheat and other basic foodstuffs such as maize and soya have also risen sharply, as demand has been increased by continuing population growth. As a result, the Asian Development Bank has warned that one billion people across Asia are now at risk of malnutrition. China is the world's biggest rice producer, but almost all of its crop is kept for the domestic market. With the world's largest population to feed, Beijing keeps rice prices subsidised. 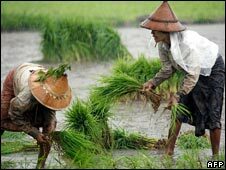 While Burma is the world's sixth largest rice producer, it is less of an exporter because of the isolationist position of its military-run government.